A quick view of the most influential metrics in Wynnewood. Wynnewood Today Wynnewood is difficult to define geographically since the post office, the election board, and the Wynnewood Civic Association use different boundaries for it. Wynnewood is surrounded by Merion, Narberth, Penn Valley, and Ardmore. It is a fully developed residential community with a well-defined commercial segment. History of the Name It is named for Dr. Thomas Wynne, personal physician to William Penn. Early Settlers The first land-owning families bore the names of Jones, Wistar, Owen, and Price, who were primarily farmers. By 1883 new names appeared on the property maps: Henry C. Gibson, distiller; N. Parker Shortridge, Philadelphia banker and director of the Pennsylvania Railroad; and Isaac H. Clothier, department store magnate. Many of the streets in Wynnewood bear the names of these families. 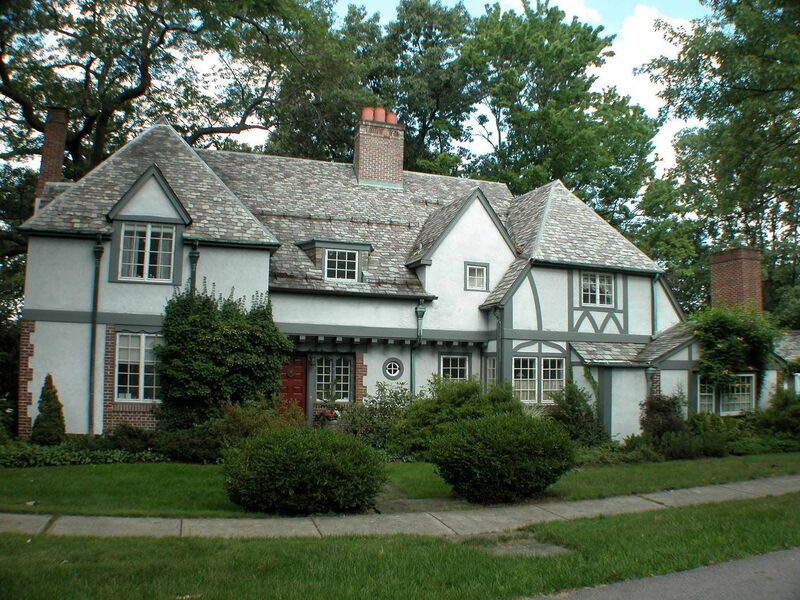 Wynnewood Homes & Architecture Begun in 1925, English Village, was designed by architect S. Arthur Love, Jr., and built by his brother, Donald Love. The houses are reproductions of Cotswold village cottages with appropriate landscaping. A winding road through the development is called Love's Lane. After World War II one of the last open areas in Wynnewood was the Shortridge tract, 160 acres of farmland with Indian Creek meandering through, bounded by Lancaster Avenue, Bowman Avenue, and East Wynnewood Road. Real estate developers had acquired the land in the thirties, but only one garden apartment complex, Wynnewood Park, and a few houses had been constructed. In 1945 there was a building explosion, and 360 single homes were built on the Shortridge Tract in a few years. Two more apartments were built, the Wyndon in 1948, and the Brynwood in 1955. Shopping & Commerce A small shopping district along East Wynnewood Road, across Penn Road from the station, had grown up earlier. It was joined in 1954 by the Wynnewood Shopping Center, housing eleven stores, a supermarket, and the department stores of John Wanamaker and Bonwit Teller. The variety of retail outposts is constantly changing. Office buildings, apartment houses (WynnewoodPlaza and Thomas Wynne) and businesses have grown up in the environs of the shopping center. Famous People, Famous Homes Walter Annenberg had a home at 312 Llanfair Road for 60+ years. His house and nine acres sold in 2007 for 10.2 million dollars. Isaac Clothier built Ballytore on West Wynnewood Rd, a stately four-floor Victorian mansion featuring a square English tower, flanked by a more aspiring oriel tower. The mansion was used by the Agnes Irwin School from 1933 to 1961, then remodeled for the Armenian Church of St. Sahag and St. Mesrob, which still uses it today. Down a straight, narrow lane from the Wynnewood Station, Henry C. Gibson, a distiller, built his massive home Maybrook. Designed to resemble a medieval Scottish castle, replete with crenelated towers, ornamented stone pillars, and cathedral ceilings, the home was built on 54 acres in 1881. The corner at Wynnewood Road and the railroad tracks was sold and the Thomas Wynne Apartment House was erected. In 1956 Miss Mary Gibson sold Maybrook to John Merriam. Having reached its centenary, Maybrook is still a beautiful reminder of a way of life that once flourished in Wynnewood. The house has remained privately owned. However, Lower Merion township has approved subdivision plans for The Reserve at Maybrook, a new 250 to 280 unit apartment complex in one four story building with an attached four story parking garage, to be sited on the Maybrook property. The plan has been hotly debated by Narberth Borough and construction delayed for years. View our selection of available properties in the Wynnewood area. Check out the latest demographic information available for Wynnewood. Learn more about schools near Wynnewood complete with ratings and contact information. Browse through the top rated businesses in the most popular categories Wynnewood has to offer.